Now that the unemployment rate has fallen to 5.3% and may go even lower, many people are considering getting back into the job market after being out for a period of time. Over the years I have worked with many re-entry moms and re-entry dads. After being home with the kids for a number of years, it can be difficult to get a handle on how to find the right path forward. A person’s former skillset may not indicate the career direction of choice anymore. Often the re-entry mom or dad is also battling some self-esteem issues. They will say, “I don’t have any marketable skills.” One guy I worked with recently said, “There is nothing I can put on my resume unless it’s diapering babies and setting up play groups.” That is usually the low self-esteem talking. When we do a fair assessment, there are usually good options to try. Where do you start when you are trying to chart your course to re-enter the job market? 1) First, think strategically about what people get paid to do. ANALYZE AND SOLVE PROBLEMS (e.g., lawyers, doctors, financial consultants, engineers, business owners, plumbers, home decorators, organizational consultants, end-of-life counselors) in a wide variety of fields. PROVIDE SERVICES (e.g., lawyers, doctors, financial consultants, wedding planners, waitresses, editors, public servants, plumbers, dog walkers, bartenders, closet organizers). TEACH, EDUCATE, AND COACH (e.g., dance instructors, soccer coaches, professors, kindergarten teachers, technology teachers). CREATE SOMETHING NEW (e.g., software design engineer, architect, developer of non-profit, entrepreneur). PERFORM AT A HIGH LEVEL TO ENTERTAIN OTHERS (e.g., actors and actresses, musicians, golfers on the pro tour, stand-up comedians, tennis players on tour, baseball players, football players). LEAD OR MANAGE A TEAM (e.g., project coordinator for a nonprofit, CEO of a company, manager of a football team, project manager for an animal shelter). 2) Think strategically about what you are good at doing that people might pay to have you do. 3) Consider how much you need to make to be able to feel the job is worth your while. Examples of bigger generators are large companies, niched specialized companies, financial institutions, the entertainment industry, sports, government, and law firms to name a few. If you “follow the money” you can usually get paid more, if that is a consideration, depending on the demand for the skillset you bring to the workplace. Low demand equals less pay (e.g., production assistant on the set of a TV show). High demand equals more pay (e.g., lead actor on the same show). If you need to bulk up your skills, do a cost/benefit analysis of the cost of learning the new skill and the potential hike in pay. For example, if you learn to be a sommelier in Chicago you can command a fairly high salary compared to a waitress or greeter. And new opportunities are always opening up, including intense, fast-track training in digital skills. People successfully completing two or three month training courses can command six-figure salaries in some locations of the country. 4) Think creatively about how your current and past skills can position you in the marketplace. Take for example a former lawyer with an undergraduate degree in communications who has been home with the children for four years but has volunteered for a non-profit as a social media coordinator and fund-raiser. This person might be very valuable in the role of communications director for a non-profit or for a small law firm. This person might also be able to create a business guiding small companies who are developing their social media and communications strategies. If she adds website design by taking classes to learn how to do this, she might be able to create even more value and leverage her skillset for a higher salary. This person might be useful in the role of the development coordinator for her college alumni association. 5) Remember to factor in your strong interests and aptitudes so that you will enjoy going to work. Aptitudes are what you do well naturally. Interests are content areas that hold your attention and motivate you to be engaged. When aptitudes and interests align, your likelihood of success goes up. Think strategically about where your skills could fit into the market so that your course becomes clearer. 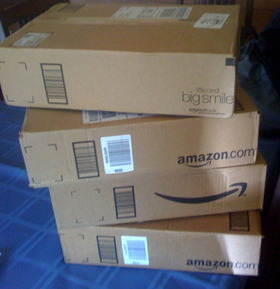 Amazon, the Workplace You Need to Leave Right Now! There are other workplaces that are equally harsh. I have counseled lawyers for 30 years and many of the stories I have heard rival the stories in the New York Times article. I have counseled lawyers who told me they were expected to work while in labor having a baby. I have counseled lawyers who said they were expected to work even when they were at their father or mother’s funerals. I have worked with lawyers who were expected to put in extremely long hours including many nights and weekends without a break, staying overnight and sleeping on the floor of their offices because that was what committed attorneys do if they want to make partner. Some lawyers told me they could not take vacation time and were faulted for spending time with their families on the weekends. I always stock extra Kleenex in my office for the lawyers who come in to work with me because some of them will spend the entire first session crying. When did being successful become equated with workaholism? Workaholism is a neurosis and a workplace should be concerned enough about its workers to discourage that kind of aberrant behavior, not insist on it. Most professional people I counsel already have very harsh superegos. They feel an intense need to work hard and long to be successful. They are driven. The internalized voices that live in their heads already castigate them and demand more and more. They whip themselves up to work harder and longer but the cost can be very high. Alcoholism. Failed marriages. Depression. Anxiety attacks. Drug abuse. How can this be a good thing? And how can a company that encourages this kind of workplace culture be a desirable place? The good news is that slavery is a thing of the past in our country. People do not have to put up with a workplace that has a culture with this level of stress and pressure. The unemployment rate is 5.3% and new evidence shows that the labor pool is drying up (see Chicago Tribune article in the Business Section, Monday, August 17, 2015, page 3). Employees are going to be able to call the shots in the very near future. When the best and the brightest refuse to work under these conditions and when they leave soul-sucking workplaces that treat them this way, workplaces will change. Workplaces will change because they have to change. They will not recruit or retain the best and the brightest if they do not. Nobody is perfect. To be human is to be flawed. And part of being flawed is having something you might think of as emotional allergies. We all have them. We probably get them from our imperfect childhoods: an overly critical mother, a combative belittling father, the brother or sister who bullied and wasn’t stopped from inflicting emotional wounds. A host of emotional problems come from these early sensitivities we harbor that can impair our ability to see the world clearly and relate to others in a productive way. Emotional allergies are like wearing a pair of glasses that misalign vision. Our emotional allergies cause us to interpret what we experience in a way that triggers us to overreact. When our emotional sensitivities get triggered, the knee-jerk allergic reaction can take over if we aren’t self-aware. It is particularly problematic if leaders have emotional allergies that incite them to attack other people personally because they feel unfairly attacked themselves. When that happens, the fallout affects many more people and can disturb whole groups of people or communities. Kelly challenges the statement that it is only O’Donnell and then pushes Trump to explain how he will answer the charge that he is part of a “war on women” touted by Hillary Clinton’s campaign. Trump’s allergy is getting inflamed at this point. Notice how he is thinking about how she has injured him. And what is the allergy? He experiences Kelly’s remark as unfair to him, a threat to his self-esteem. She has intentionally hurt him and shamed him in front of millions of people by exposing his own prior statements, namely his inflammatory remarks about women. He is primed to get her back for bullying him. She has inflicted a narcissistic injury and he will get even. This over-the-top remark gets Trump into hot water with many Republican conservatives who then disinvite him to their Red State Dot Com event. Meanwhile, the Republican Party is wringing its collective hands trying to figure out how to muzzle Trump’s narcissistic rage. What does this have to do with your work life? In the executive coaching work I do, I often hear about narcissistic people who impose their angry outbursts on others. I also work with some difficult people who are sent to me or are self-referred to get help with their relationship problems. Litigators are particularly prone to have Trump-like issues with their office staffs but are often unaware that they are bullies. Instead, like Trump, feel they are the ones being mistreated. 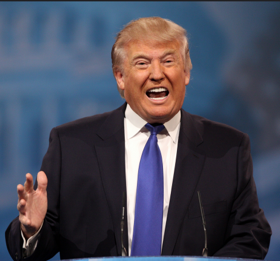 Although it is rare to hear about someone as combative and outspoken as Trump, it is not rare to hear about people with narcissistic reactions who rage at their co-workers when they experience a real or imagined insult. Many powerful people who rise to positions of authority have this personality flaw. Why? Because they seek power and are often seen as charismatic and inspiring because of their strong opinions and uncompromising, unapologetic stands. But just imagine having to work with a boss like Trump on a daily basis. You would have to tiptoe around his allergy. Once he experiences that real or imagined slight, he would come after you personally. Was Trump belittled, put down, or made fun of as a kid? Probably. And now that allergic sensitivity propels his own defensive bullying in a hot-flash response to something he experiences as unfair. The American people might like this current political blood sport because it matches the way so many feel: hurt by what’s going on in the world at large and in their current lives, and wanting to get even. But when it comes to a workplace, it is devastating to have such people running amok with their emotional reactions, forcing others try to figure out how to cope with them. It is particularly toxic when the boss or the leader of an organization imposes emotional allergies on the work group or a particular person. In a work setting with a prominent but highly allergic leader, people need to band together to reign in the behavior and set limits. It might help to require this person to get therapy or counseling, using the threat of firing if the behavior does not change. What can you do if you have to work with an emotionally allergic boss who is unaware of the problem? Try to have a conversation with this person but only if you have some evidence that the person would be able to listen. You don’t want to get fired. Plan your conversation in advance by thinking through your key points. Meet in person, not on the run. Tell the boss you would like to have a conversation and that you hope you both can approach it with open minds. Do approach the conversation with an open mind, interested in learning why the your boss acts that way and how he or she experiences the situation. Express what you experience when yelled at and how it adversely affects your work product. And finally try to figure out what can be done by both of you to fix the problem if you both work at it. Some people are able to have difficult conversations and can change. Others are incapable of that. Find out if your workplace is able and willing to help you. Workplaces differ on this. A lot. Some leaders have clout and are given free rein to terrorize the staff. At some workplaces no one has the guts to stand up to the powerful person who is great at generating business. However, some workplaces do have policies and approaches that protect staff from leaders who bully. Check with key executives who might have influence by meeting one-on-one and explaining the problem from your perspective. Professional development staff might or might not have the power to subdue the difficult boss. Leave the workplace. Sometimes this is the best way to avoid ruining your career. Try to be sure you plan your departure and leave with at least one or two good references from people in the workplace who will vouch for you if you need an endorsement. People in positions of power who have serious emotional allergies such as narcissistic personality disorder can wreak havoc in the workplace and beyond. Everyone knows that when it comes to getting a job, it’s who you know. Right? Actually, think again. After counseling and coaching and watching hundreds of successful job searches in my counseling practice, I’d say it’s who you don’t know … YET that matters just as much or more. When you look for a job using an interpersonal or networking approach, which is still the most productive and effective way for job seekers to find opportunities, you start the search with people you know well in your industry, or with a group of people who are connected to the work neighborhood in which you are trying to find opportunities. If there is low hanging fruit, a job that is known to be open and needs to be filled, and your skillset matches well, it’s true that you might get very lucky very quickly in your search. By asking people in your immediate group of professional connections about jobs they have heard about, you could learn about this opportunity, come to the attention of the workplace through a trusted contact, and land your next job quickly. But in the experience of my job-seeking clients, it is often the third, fourth, or fifth person they connect with who tells them about the opportunity that is coming up soon at a workplace, or that needs to be filled but there is no posting yet, or that is not even advertised because the need is there but the workplace has not yet posted a position. There is a reason for this. It is estimated that 80% of jobs are not advertised. To find them you have to go on a hunt. As you talk with friends and friends of friends, especially if you talk with them in the right way, and you are in the right realm where your skills are in demand, by interacting with the third, fourth, or fifth person, going from one trusted contact to another, you are enlarging the range of possibilities to uncover workplaces that could use your help. Some may be advertised, others may not yet be advertised, and still others may never be advertised. There may never be a posting, or there might be a bogus posting, a job posted online to satisfy protocol but the hire is already decided. 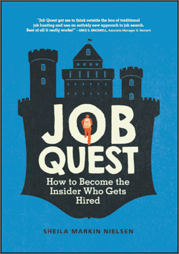 When you engage in a process I term “rapid relationship and trust building,” which I describe in my book Job Quest: How to Become the Insider Who Gets Hired, you are setting up a series of vetting meetings with key people who will brainstorm with you. As long as you use the right messaging to open the conversation, you can gain critical insights into the market, work neighborhood, or realm where you are searching. As you work your search, engaging in long gossipy rumor-filled conversations with people in your industry, you will hear about opportunities. This company has a large project that will start in the fall. Another company is expanding rapidly. A law firm just lost a group of partners and associates who moved to a different firm and now that original firm needs to staff up with new people to fill the gap. A friend of a friend tells you that someone with your same skillset who works at her company will be leaving soon to move to another state. Still another person you learn about is pregnant and has told your mutual friend that she will not be coming back, but the company does not know that yet. All of this is good gossip that may lead to opportunities for you. In the process of talking with many people in the target industry, you also create friendships and trust relationships with a wider group of people who will say good things about you in the grapevine where employers hunt. This is where they find people to hire who are endorsed by people they trust such as current staff. If you are helpful as you network with people in your industry, and you are generous and give back to people who help you to advance your market knowledge, you will rapidly increase the sheer number of possibilities for job opportunities. You can improve that likelihood even more if you treat everyone you interact with as a genuine new and valued friend, and give back to them. What do you give? Gifts of information, connection, support, and help are appreciated by most people and cost you nothing other than some time. When people recognize that you are a good person, someone they would like to work with or have on their team, they are more likely to informally endorse you to others in the realm, including people in positions to hire or influence the people who hire. All of this adds up to a greater likelihood of landing a job. We know that 70% of jobs are found by networking. And good networking includes this process of vetting meetings, brainstorming, and giving back to others. But what about the idea that it’s WHO you know that gets you hired? In other words, Daddy or Mommy has connections and pulls the strings to land you the job, or calls in a favor to get you hired. Isn’t that the real meaning of the phrase “It’s who you know”? Well, maybe that is the real meaning, but the reality today is different. Okay, you might land a job because Mommy or Daddy pulled the strings, but you won’t keep a job if you are bad at it. Most legitimate workplaces do not like to hire only as a favor, although they will give a candidate a second look as a favor to see if the skills of the candidate match up with their needs. Few workplaces want to waste good money on poor risks. I have occasionally seen people get hired because of a favor, but I have also seen those same people stifled in those jobs because they were nothing more than placeholder positions, not challenging or skill-enhancing jobs. In addition, if you land a job because of the clout of a powerful person, that process doesn’t do anything positive for your own self-esteem and self-worth. Gaming the system turns out to be as bad for you as it is for the workplace. When it comes to getting a job by networking, it is often those people you don’t know … yet who will open the door to the job that furthers your career.